"The strange sound emanating from the piano gave 11-year old George Hewison an ‘awful shock’. He opened the back and found it stuffed with court injunctions.” Toronto Star May 12, 2003. That episode cemented what was to become a life-long marriage of music and labour for Hewison. George Hewison’s first public appearance was at a festival in Parksville, British Columbia in 1960, not long after his voice changed from soprano to bass. He has since performed across the country and abroad on radio and television, in coffee houses, concerts (large and small), night clubs, theatres, rallies, conventions, rallies, picket lines, and festivals. 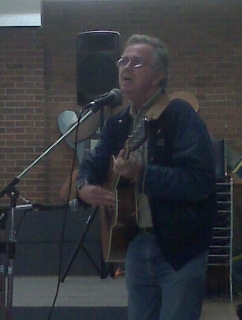 He has been writing and singing songs of Canada’s working people for five decades. He has inspired tens of thousands of activists from all parts of the country with his rich baritone voice and edgy lyrics. He is founder and lead singer of the “Rank n File Band”; has performed and recorded with “Joe Hill” composer, Earl Robinson. His latest album is entitled “Uncharted Waters”.